Here’s the full audio of Pastor Michael’s sermon from February 11, 2018, on Jesus’ teaching in Matthew 6:19-24. 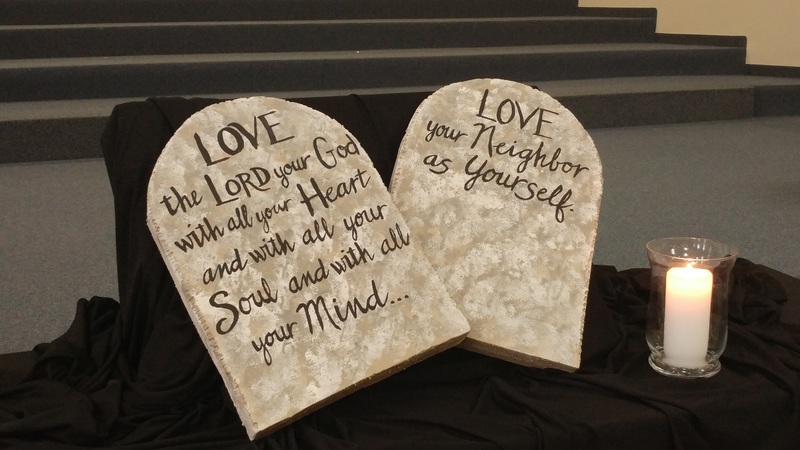 This is part of our second series this year on the Sermon on the Mount, this one focused on “Love as the Fulfillment of the Law.” The television commercial mentioned in the sermon can be viewed here. The sermon by Martin Luther King mentioned in the sermon can be read and listened to here. Jesus says that he has come “to fulfill the Law and the Prophets,” to bring them to their completion, to their climax. Through his teaching about loving God and others, and through his life, death, and resurrection demonstrating God’s love for all, Jesus “fulfills the Law,” the Old Testament Law of Moses. As we have seen, sometimes this “fulfilling the Law” looks like Jesus digging down below the external actions described in the Law and getting to the roots of those actions. Sometimes this “fulfilling the Law” looks like Jesus outright overturning a specific commandment from the Law that simply doesn’t fit with the law of love. And sometimes, like in our teaching today, this “fulfilling the Law” looks like Jesus highlighting a prominent theme in the Law of Moses and bringing it home to our everyday lives. Because that’s what’s behind all Jesus’ teaching about money: the Law of Moses. And there’s a lot of teaching by Jesus on money—it is, in fact, one of his most common topics. Behind all of it is the economic justice advocated in the Law of Moses. Debts were forgiven. This ensured that no one would ever be crippled by debt—you couldn’t actually have any debt hanging over you for more than seven years. Land was returned to the original family who owned it. This ensured that those who had to sell their land to pay off debts wouldn’t remain landless forever. Jewish slaves were freed. This ensured that those who had to sell themselves to pay off debts wouldn’t remain enslaved forever. For anyone mired in poverty, shackled by debt, the Jubilee year would have felt like being raised from the dead, like being blind and now seeing, like being lame and now leaping for joy! So, yes, economic justice was a prominent theme through the Law of Moses. And it remained a prominent theme through the Hebrew Prophets. From Isaiah to Amos, from Jeremiah to Micah, the prophets highlighted injustice against the poor, the widow, the orphan, and the foreigner as particularly judgment-worthy sins in ancient Israel. In other words, Jesus comes to fulfill the Law—including its emphasis on economic justice. The way of love is the way of justice for all, including (and even especially) economic justice. This is probably a whole sermon series in itself. There’s no doubt that there’s a lot that can be done for us to pursue economic justice in our world today. How does our economic system saddle people with debt in a way that Moses, the Prophets, and Jesus would deplore? What would Moses, the Prophets, and Jesus say about our system of high-interest loans? About the number of disadvantaged people struggling to support a family on less than living wages? About our approach to property ownership? Or to indigenous land claims? All these are about economic justice, and the Law and the Prophets, and Jesus in fulfillment of them, have much to say about these things and more. This entry was posted in Michael Pahl and tagged audio, economic justice, generosity, greed, jesus, justice, love, martin luther king, poverty, sermon on the mount, simplicity. Bookmark the permalink.